Majokko Club Yoningumi (The Magical Girl Club Quartet) is a magical girl franchise by Studio Pierrot. It is a collective universe of the series Magical Angel Creamy Mami, Mahou no Star Magical Emi, Mahou no Yousei Persia and Mahou no Idol Pastel Yumi. There is a male Furo scene. Mai Kazuki has a Bath. All episodes aired in 1986. The OVA mostly consists of recap footage but has scenes inbetween it of Yuu Morisawa, Mai Kazuki and Persia Hayami at an Onsen. 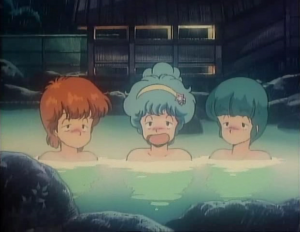 Recap footage of Mahou no Star Magical Emi episode 32's bathing scene is shown in this OVA as well. Many unnamed females are seen running out of Public Bath only in their undergarments and one in a Towel because a tentacle monster invaded the girls side and non of them had time to fully get dressed. A male is seen casually leaving the males side and is frightened at the site of the tentacles chasing after the women.